Without question a highlight of last week's T.R.A.F.F.I.C. East conference at Fort Lauderdale Beach, Florida was a rousing debate over the pros and cons of new gTLDs that pitted teams led by industry giants Rick Schwartz and Frank Schilling against each other on Monday, Oct. 21. Schwartz, the T.R.A.F.F.I.C. Co-Founder and immensely successful domain investor who is a bear when it comes to new gTLDs, recruited fellow investor Lonnie Borck to argue the case that .com will continue to thoroughly dominate the domain landscape. Legendary investor Schilling, who is also the head of new gTLD registry operator Uniregistry.com, was joined by three fellow new gTLD advocates - Tim Johnson (.kiwi), Jeffrey Sass (.club) and Monte Cahn (RightOfTheDot.com) - in a quarter that tried to counter Schwartz and Borck's arguments. 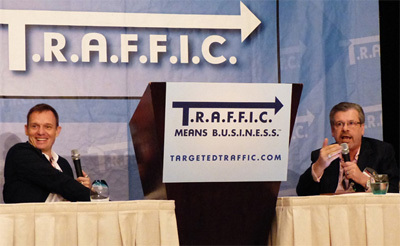 Frank Schilling (left) and Rick Schwartz trade punches in a lively debate about new gTLDs Oct. 21 at T.R.A.F.F.I.C. East. In addition to being an informative give and take it made great theater so people were delighted when Schwartz promised to put a video of the debate online so everyone could enjoy it. You can see part one (of two) by clicking play below and Schwartz said the second part will be available early next week. Believe me, this is a show you won't want to miss! While the debate over new gTLDs goes on, several companies involved in rolling out or supporting new extensions have formed a new association to promote gTLDs. 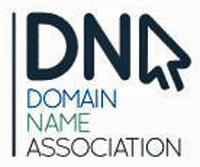 Founders of the international nonprofit organization known as the Domain Name Association (located at TheDNA.org) said the association that was announced Monday (Oct. 28, 2013) was created to "promote the interests of the domain name industry by advocating the use, adoption, and expansion of domain names as the primary tool for users to navigate the Internet." Their press released added, "The Domain Name Association will educate Internet users around the world about the benefits of domain names, with a specific focus on the imminent introduction of new Top-Level Domains," The DNA thinks new gTLDs "will revolutionize the way we navigate the Internet." Others are not so sure about that, of course, as shown by the Schwartz-Schilling debate above. Membership in tne DNA is open to organizations involved in all aspects of managing domain names, including domain name registries, registrars, resellers, and registry service providers. Founding members serving on an Interim Board include ARI Registry Services, Demand Media, Donuts, FairWinds Partners, GoDaddy, Google, Momentous, United TLD, and WhatBox?. DomainsBot Inc., Minds + Machines and RightOfTheDot, LLC are also Founding members.